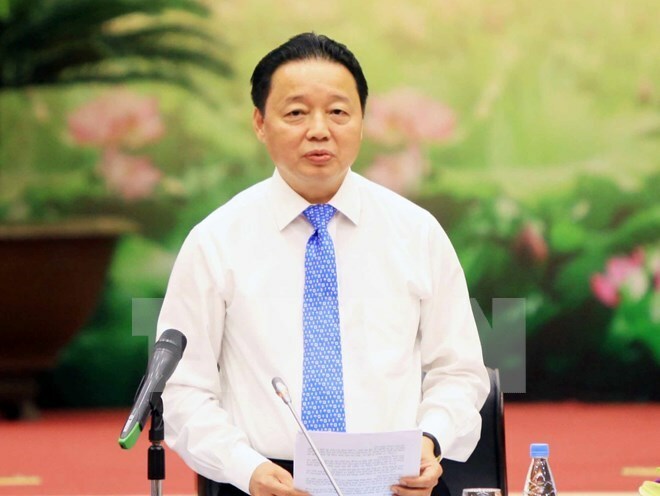 Hanoi (VNA) – Enhancing transparency in the natural resources and environment sector was a message that Minister Tran Hong Ha has sent to people, enterprises and his employees in an online exchange on November 7. The exchange focused on perfecting policies and laws on natural resources and environment to remove difficulties for people and businesses. The Ministry of Natural Resources and Environment always pays attention to improving institutions, policies and laws on the field as well as simplifying procedures to create favourable conditions for people and enterprises and cut costs. For example, Ha said, the sector reduced 30 procedures in land management in areas with the land registration office and nine in areas without the office, and 40 percent of procedures in the mining field. The time to complete procedures was also cut down on all types of procedures. However, he admitted shortcomings in some current policies and mechanisms, especially those in land and water resources management and the environment. By 9am on November 7, the ministry and its 63 provincial and municipal departments received 462 questions with half of them related to land.